When I was a kid, watching Cheers on Thursday nights at 9:00 p.m. felt like the beginning of the weekend. I hated going to school, never getting enough sleep in the morning and pretending I gave a damn about what was going on during the day while pining for 3:30 p.m. so I could get the hell out of there. When my family gathered around the television to watch Cheers, it was like taking a half-hour sigh of relief. Cheers meant that the awful school week was almost over. Watching Cheers was like coming around a bend and seeing the final straightaway of an exhausting foot race. Now there are so many choices that television is a bastion of chaos. My 3-year-old nephew will probably never experience television as a timepiece like I did. He’s growing up in the age of the DVR, when we can tape what we want or use Hulu or HBO Go or another digital service and likewise liberate ourselves from the television schedule. Our relationship with TV changed and there’s something precious from my childhood that will be probably be completely absent from my nephew’s. Saturday mornings were the most freedom I experienced as a kid. It was time to watch cartoons, to dance around the channels for hours while Mom made breakfast and my sisters and I lounged around in our pajamas. Pee-wee’s Playhouse was the very last show in the Saturday morning animation block, and I remember the end credits making me feel really sad. 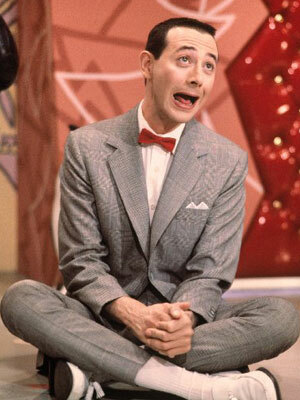 The closing music is melancholy to begin with, but the end credits of Pee-wee’s Playhouse meant that the Saturday morning freedom was over. The minute the show ended, it was time to mow the lawn or do other chores or jump in the shower and get dressed because there were errands to run. I liked that sad feeling of Saturday mornings being over. It made me realize how special they were. My nephew may still experience moments like these because it’s not as though television schedules are gone. A few years ago I used to religiously watch Seinfeld weekday nights at 7:00 p.m. rather than use the DVR because it was a nice excuse to make myself stop moving and just sit down and relax for a half hour. I usually watch True Blood on Sunday nights at 9:00 p.m. because I don’t feel like waiting to see the show. These are choices, though, and I think there was something about being forced to watch a TV show at certain times that was responsible for the power of those moments from my childhood. It’s not the same when I choose to adhere to the schedule. Television shows like Cheers and Pee-wee’s Playhouse were like phases of the moon or the changing of the seasons, predictable events that carried larger meanings. The rest of the TV schedule was like notches on a sundial. I had to have my homework finished in time to watch ALF at 8:00 p.m. on Monday or The A-Team Tuesday nights at the same time. Moonlighting at 9:00 p.m. Tuesday nights on ABC meant it was almost time for bed. Today I might look at slavish devotion to a television schedule and find it sad, but there was a comfort in the regularity of TV programming when I was a kid. It gave the week structure. Television was a force for order. Now when I sit down to watch TV I have episodes of at least five different shows on my DVR. Or I can call up my On Demand menu and check out the last three or four episodes of a show I don’t watch regularly enough to set a recording schedule for but still enjoy watching now and again. Now there are so many choices that television is a bastion of chaos. 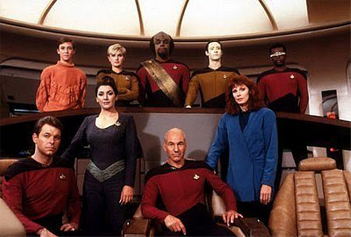 I managed to hold on to a taste of my childhood relationship to television through my freshman year of college, when all the Trekkies in my dorm would gather in the first floor television lounge and watch Star Trek: The Next Generation. The TV schedule was a source of nerdy ritual and community, and also a reminder that after a weekend of partying I had class the next day. I stopped watching television almost entirely for years after my freshman year, and the next time I had a proper apartment with cable television I had moved in with my future wife. We watched Farscape and Stargate SG-1 and Battlestar Galactica when they aired rather than just taping them with our VCR, but now that I work two jobs and she’s a busy writer we use the DVR almost exclusively for watching television shows – and we lost something in the process. It’s the same thing I lost from my childhood. I love being able to skip commercials and re-watch episodes, but I miss getting up to pee during the commercial breaks and running back to the couch to make sure I didn’t miss anything. There was a really fun energy to that moment, telling my sisters to hurry before the show came back and hearing them giggling as they ran back into the living room. When we only got to see an episode once before the season cycled through and we could catch a rerun I think we paid more attention. Watching television was an event, something to get excited and plan for. Those times when your favorite program came on were special. Now we just hit the play button. Follow more of Dennis Scimeca’s nostalgia on Twitter @dennisscimeca.